Teaching children about the option of adoption is important so they can experience love and compassion at a young age. That decision to save a dog’s life and give him a home inspired her to write a children’s book, “Maverick and Me,” to teach children the value of adopting pets. Now Katherine and Maverick, work to spread a message of hope, defying all odds, and the joys of finding forever friends through pet rescue. Schwarzenegger joins Danny Trejo, Carrie Ann Inaba, Denise Richards, Nils Lofgren, Josef Newgarden, Amanda Seyfried, Cecily Strong, Maggie Q, Elisabeth Rohm, Lisa Edelstein , Tricia Helfer, Emmy Rossum, Michelle Beadle, Jack and Suzy Welch, Mike Rowe ‎, Allison Janney, Whitney Cummings, Christopher Walken, Bob Odenkirk, Britt Robertson, Lauren Ash, and Bobby Bones among other luminaries ‎participating in national animal welfare organization Best Friends Animal Society’s photo campaign featuring celebrities posed with their personal rescued dogs and/or cats in support of the Save Them All ‎call to action. Best Friends Animal Society is a leading national animal welfare organization dedicated to ending the killing of dogs and cats in America's shelters. In addition to running lifesaving programs in partnership with more than 2,100 animal welfare groups across the country, Best Friends has regional centers in New York City, Los Angeles, Atlanta and Salt Lake City, and operates the nation's largest no-kill sanctuary for companion animals. 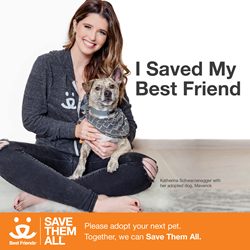 Founded in 1984, Best Friends is a pioneer in the no-kill movement and has helped reduce the number of animals killed in shelters nationwide from 17 million per year to about 1.5 million. That means there are still more than 4,100 dogs and cats killed every day in shelters, just because they don’t have safe places to call home. We are determined to get that number to zero by the year 2025. Working collaboratively with shelters, rescue groups, other organizations and you, we will end the killing and Save Them All. For more information, visit bestfriends.org.